High Roller Pony Con - the convention attempting to build new life in the smoldering fandom crater that was left in Las Vegas nearly half a decade ago - has an important, and...bizarre, announcement. 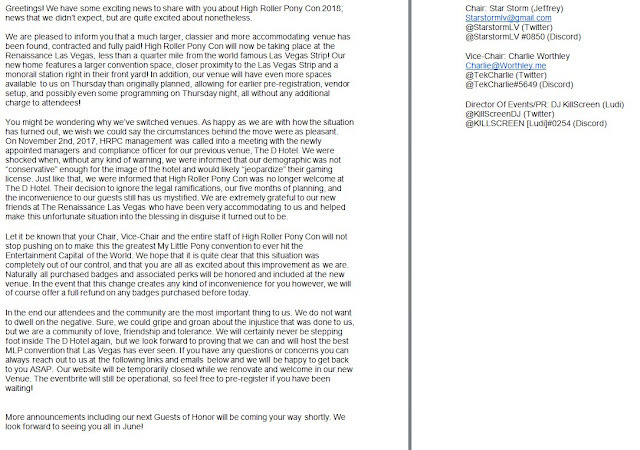 Bronies are "not conservative enough" for a Las Vegas hotel. That's right folks, a city that runs on a constant stream of liquor, gambling, and vice cannot handle people in horse costumes congregating in their midst. As a result, HRPC is no longer getting The D.
The D is a hotel by the way. A hotel whose slogan is "Long on fun. Short on ordinary." Clearly that's not the case. In their announcement, HRPC has relocated to The Renaissance Las Vegas and is moving forward. For more information contact them directly. Something tells me that The D is doing something shady if one convention of pony fans leads them to a risk of losing their license. Must've gotten spooked by what happened at Las Pegasus Unicon. Wasn't it pretty well proven that the organizers were actual, real scam artists that pulled a bunch of scams under very similar pseudonyms? Like the tag says - "Too Stupid To Make Up"
When someone sane is acting strangely and is giving you strange reasons for doing so, they simply are deceiving you, keeping the true reason a secret. The hotel is hiding something. That's my theory as well. I have no evidence for this, but my hunch is that a bigger client with deeper pockets came along and wanted our weekend, and this was the D's poorly conceived way of getting out of our contract. Is there anywhere we can find the letter from the hotel? sounds like it would be a fun to read. Yes, but will they have a ball pit? The blog is great and interesting, it is very helpful to me, thank you for sharing this article with readers.